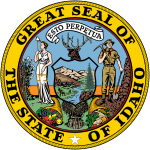 The 2018 Idaho gubernatorial election took place on November 6 to elect the next governor of Idaho. Incumbent Republican Governor Butch Otter chose not to run for a fourth term, and the state's primaries were held on May 15. Former state representative Paulette Jordan was the Democratic Party's nominee. She lost to incumbent lieutenant governor Brad Little by a wide margin for a seventh consecutive Republican victory. A record 605,131 votes were cast for governor in 2018, a 37.6% increase over the previous election in 2014 (439,830 votes). The previous high was 452,535 votes in 2010. *–Denotes candidates who did not enter the race. ^ a b Russell, Betsy Z. (October 14, 2014). "Otter on running for 4th term: 'If I did, I'd be running as a bachelor, my wife told me'". The Spokesman-Review. Retrieved July 7, 2016. ^ Legislatures, National Conference of State. "2018 State Primary Election Dates". www.ncsl.org. Retrieved May 22, 2018. ^ Dentzer, Kevin (February 28, 2017). "Ahlquist makes it official: In campaign for governor, he starts 97-town tour this week". Idaho Statesman. Retrieved March 1, 2017. ^ a b c d e f g h i j k Russell, Betsy Z. (March 10, 2018). "Candidates flock to file for Idaho's May primary election". The Spokesman-Review. Retrieved March 31, 2018. ^ Russell, Betsy Z. (May 9, 2017). "Idaho Rep. Raul Labrador files to run for governor in 2018". The Spokesman-Review. Retrieved January 11, 2018. ^ Richert, Kevin (October 26, 2017). "Christy Perry considers run for Congress". Idaho Education News. Retrieved October 30, 2017. ^ Dentzer, Bill (June 28, 2016). "Brad Little, Idaho's governor-in-waiting, commits to 2018 run". Idaho Statesman. Retrieved July 7, 2016. ^ a b c d e "Candidate Treasurer List with Mailing Addresses for 2018" (PDF). Idaho Secretary of State. December 21, 2017. Retrieved January 11, 2018. ^ Berg, Sven (August 24, 2016). "Fulcher announces he'll run for governor again in 2018". Idaho Statesman. Retrieved August 25, 2016. ^ Russell, Betsy Z. (June 15, 2017). "Fulcher drops out of guv race, switches to 1st CD, winning Labrador's endorsement". The Spokesman-Review. Retrieved June 16, 2017. ^ Spence, William L. (February 6, 2016). "Lori Otter says she doesn't plan to seek office". Lewiston Morning Tribune. Retrieved September 15, 2016. ^ Russell, Betsy Z. "Wasden to seek another term as Attorney General, not join crowds running for governor, Congress". The Spokesman-Review. Retrieved September 8, 2017. ^ Kruesi, Kimberlee (October 25, 2017). "Mitt Romney Endorses Tommy Ahlquist for Idaho Governor". USNews.com. Retrieved November 3, 2017. ^ Russell, Betsy Z. (September 19, 2017). "Ahlquist names Damond Watkins as campaign chairman". The Spokesman-Review. Retrieved September 20, 2017. ^ "Meridian mayor named co-chairwoman for Ahlquist campaign". Meridian Press. September 19, 2017. Retrieved September 20, 2017. ^ "Gubernatorial Candidate Dr. Tommy Ahlquist Announces Campaign County Chairs 107 Business, Community & Conservative Leaders Join Campaign Team - Tommy Ahlquist for Idaho". Tommy Ahlquist for Idaho. September 14, 2017. Retrieved September 19, 2017. ^ a b Betsy Z. Russell (April 30, 2018). "Ahlquist wins endorsement from prominent young Trump backers Candace Owens and Charlie Kirk". The Spokesman-Review. ^ Price, Mike (September 26, 2017). "Olympic gold medalist visits Idaho Falls to campaign for Ahlquist". East Idaho News. ^ Russell, Betsy Z. (November 1, 2017). "Labrador announces Ted Cruz is endorsing him for governor of Idaho in '18". The Spokesman-Review. Retrieved November 2, 2017. ^ "Conservative Legislators Endorsement". Labrador for Governor. May 1, 2018. ^ "Former Rep. Ken Andrus Backs Raul Labrador". Labrador for Governor. May 9, 2018. ^ "Labrador wins variety of endorsements". Idaho Politics Weekly. May 6, 2018. ^ "Labrador Releases Heller Endorsement and 200 Member Coalition". Labrador for Governor. April 20, 2018. ^ "IPC-ABC Endorses Raul Labrador for Idaho Governor". Retrieved May 22, 2018. ^ "Idaho Chooses Life Endorses Labradorfor Governor". Labrador for Governor. April 26, 2018. ^ "BREAKING: Family Policy Alliance of Idaho Endorses…". Family Policy Alliance of Idaho. May 10, 2018. ^ "Otter Endorses Little in Idaho Governor's Race". U.S. News & World Report. Associated Press. May 16, 2017. Retrieved February 10, 2018. ^ "Brad Little should be the next governor of Idaho". Idaho State Journal. April 24, 2018. Retrieved May 5, 2018. ^ Brown, Nathan (August 25, 2017). "Little to run for governor". MagicValley.com. Retrieved November 27, 2017. ^ "Twitter". twitter.com. Retrieved May 22, 2018. ^ a b c d "State Finance Organization". Brad Little for Idaho. Retrieved February 10, 2018. ^ Dentzer, Bill (June 29, 2016). "Little to run for governor". MagicValley.com. Retrieved November 27, 2017. ^ a b c d "Brad Little for Governor Campaign Announces Statewide 44 County Campaign Coordinators". Brad Little for Idaho (Press release). September 14, 2017. Retrieved November 27, 2017. ^ "Primary election endorsements". Retrieved May 22, 2018. ^ a b "Brad Little, A.J. Balukoff are best choices for governor". Retrieved May 22, 2018. ^ a b side, Balukoff on Democratic. "Endorsements: Little, Balukoff in the primaries for governor". Retrieved May 22, 2018. ^ "Pragmatic and responsible, Brad Little is ready to lead Idaho". Idaho Statesman. October 21, 2018. ^ "Idaho cattlemen endorse Little for governor". Capital Press. November 16, 2016. ^ "Professional Fire Fighters of Idaho Announce Endorsement". Brad Little for Governor. ^ "Idaho Associated General Contractors Announces its Endorsement". Brad Little for Governor. ^ "Idaho's Logging Contractors Support Brad Little to be Idaho's Next Governor". Brad Little for Governor. ^ "The Idaho State Dental Association Supports Brad Little to be Idaho's Next Governor". Brad Little for Governor. ^ "IDAHO REALTORS ENDORSE BRAD LITTLE". Coeur d'Alene Press. April 19, 2018. ^ "Idaho Grain Producers Put Their Support Behind Brad Little". Brad Little for Governor. ^ "Idaho Doctors Put their Support Behind Brad Little to be Idaho's Next Governor". Brad Little for Governor. ^ "Small Business PAC Endorses Little for Governor". NFIB. September 10, 2018. ^ Kruesi, Kimberlee (November 2, 2017). "Idaho Democrat announces another run for governor". KTVB. Retrieved November 3, 2017. ^ Brown, Nathan (May 8, 2017). "Gov's race busy with more than a year till primary". Times-News. Retrieved September 1, 2017. ^ a b c d e f g h i "The three most recent Democratic US Congressmen from Idaho have joined together to endorse AJ Balukoff - AJ Balukoff for Governor". March 29, 2018. Retrieved May 22, 2018. ^ "A.J. Balukoff for Idaho". www.facebook.com. Retrieved May 22, 2018. ^ a b c "A.J. Balukoff for Idaho". www.facebook.com. Retrieved May 22, 2018. ^ a b c "Senators Jordan and Ward-Engelking; Representative Chew Endorse A.J. Balukoff for Governor - AJ Balukoff for Governor". March 12, 2018. Retrieved May 22, 2018. ^ a b "Two More Idaho State Representatives Endorse A.J. Balukoff for Governor - AJ Balukoff for Governor". March 15, 2018. Retrieved May 22, 2018. ^ "AJ Balukoff for Governor" (PDF). AJ Balukoff for Governor. Retrieved May 22, 2018. ^ Russell, Betsy Z. (February 6, 2018). "Rusche endorses Balukoff over Jordan in Dems gubernatorial primary". The Spokesman Review. Retrieved February 22, 2018. ^ a b "Endorsements - AJ Balukoff for Governor". Retrieved May 22, 2018. ^ Locher, John (January 24, 2018). "Cher endorses Paulette Jordan for Idaho governor". Moscow-Pullman Daily News. Retrieved February 20, 2018. ^ a b "Who's With Paulette? - Jordan for Governor". Retrieved May 22, 2018. ^ Kruesi, Kimberley (March 15, 2018). "Democratic Governor Candidates Begin Collecting Endorsements". U.S. News & World Report. Retrieved March 16, 2018. ^ "Paulette Jordan". Our Revolution. Retrieved May 22, 2018.